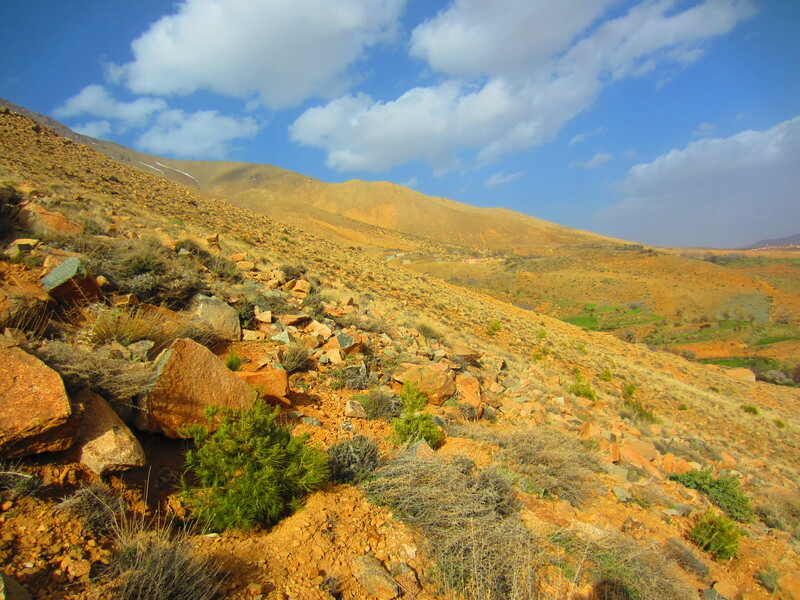 Tree planting helped reduce erosion during heavy rainfall events in Tasloumt in Morocco's High Atlas. In recent years, communities in the Tifnout Valley in Morocco have begun experiencing the impacts of climate change, including increases in extreme, unpredictable rain events that cause damage to important infrastructure, along with with a decrease of precipitation and rise in mean temperatures. To respond to these impacts, village representatives in the Tifnout Valley have come together through an innovative approach to share ideas, replicate successful practices and create a plan for climate resilience throughout the entire valley. Following a series of successful adaptation interventions in the villages of Tasloumt and El Moudaa between 2009 and 2012, neighboring communities looked for ways to capitalize on the successes of these isolated projects, eventually forming the Federation of Associations of Toubkal in 2013 to share information and best practices and explore new resources. To date, the Federation has successfully replicated interventions in forest regeneration and improved irrigation in five additional villages and has mobilized resources to scale up these practices and others in nine additional villages. The Tifnout Valley of Morocco’s High Atlas mountains, which lies 20 km from the highest peak in North Africa, Mount Toubkal, is home to 45 villages that make up the Rural Commune of Toubkal. The Berber communities of Tifnout, indigenous to the region for nearly 2000 years, practice traditional agriculture and pastoralism that depend heavily on the natural resources around them. Recently, the community has begun experiencing the impacts of climate change, in particular, an increase in extreme, unpredictable rain events, coupled with a decrease of precipitation and rise in mean temperatures.. Heavy rains cause flooding and erosion, which damage important infrastructure, including irrigation canals, roads, fields, and even houses. These effects of climate change disproportionately affect poor communities like those in TIfnout, who have fewer resources to cope with its impacts and who are dependent on climate-sensitive agriculture for their livelihoods, The isolated villages are also more vulnerable due to mere geography which prevents them from accessing resources they need, especially in times of stress or shock. To respond to these impacts, village representatives in the Tifnout Valley have come together through an innovative approach to share ideas, replicate successful practices and create a plan for climate resilience throughout the entire valley. After successful adaptation interventions between 2009 and 2012, neighboring communities looked for ways to capitalize on the successes of these isolated projects. After 45 initial meetings of village representatives over the course of nearly two years, the idea of a federation emerged as a strategic way for their respective communities to work together and address the common impacts of climate change. In 2013, the Federation of Associations of Toubkal was formed. The Federation has identified the interventions of forest regeneration, improved irrigation, and protective gabions as priority activities for their region, but also supports associations in identifying other needs in their communities and finding the means to address them. To date, the Federation has successfully replicated interventions in forest regeneration and improved irrigation in five additional villages and has mobilized resources to scale up these practices and others in nine additional villages. This year, the villages of Taska-Agarzen, Takatert, Tagourimt-Tanserft, Tasloumt, and Tukunt, will be supported by the UNDP Small Grants Program to implement the interventions. Four other villages, Missour, Tisalday, Andous, and Tamslout, have conducted studies in their sites and are positioned to receive support from the Japanese Embassy to implement their interventions. Began in 2013 with the goal to increase impact and harness additional support by working collectively. Brings together 32 local village associations and serves as a means for individual associations to exchange ideas, pool resources, and strengthen their capacity to respond. Regeneration and tree planting To combat erosion in the valley, the Federation has successfully supported community-initiated land management and tree planting. In 2009, the village of Tasloumt's local association, Ouanamrou Development and Cooperation Association, first began to tackle the increasing problem of erosion by closing off and replanting an area of the mountainside above the village in order to facilitate regrowth and reinforce the slope against erosion. Community members saw that the once forested slopes were now bare, causing rocks and debris to frequently fall during storms, damaging fields and infrastructure. Seeing the effect of the deforestation on their property, the community agreed to refrain from harvesting wood and grazing sheep on the slope and the Association obtained additional trees to replant there. Each year since, the protected area has been expanded higher and higher in the mountain, and the community plants approximately 1000 trees in the area annually. Following Tasloumt's success with forest regeneration, similar replanting solutions were initiated in the neighboring villages of El Moudaa (with support from a UNDP pilot project), Adad and Tamsoult. In each village, community members together agreed to close off the degraded area and replant trees, without any external enforcement. In the village of Tasloumt alone, 7500 trees have been planted on the village's slope since 2009, while in the neighboring village of Adad and Tamsoult, an additional 4000 trees were planted in their respective enclosed areas. Improved Irrigation Systems With increasing frequency of storms, traditional community-managed irrigation canals are often destroyed by fallen rocks and debris during periods of heavy rain and erosion. Community members normally come together to fix the infrastructure, which can take several days, but repairs made to the system are only temporary, leaving the system vulnerable to destruction again. Additionally, decreasing rain in the summer season force communities to ration existing water supplies. When water is especially scarce, the farthest fields are often left unfarmed as water is absorbed along the way in the traditional canals before reaching them. To safeguard the irrigation system, the initiative has fortified the systems with underground PVC piping and cement reinforcements, which protect the system from erosion, allow faster transport of water from the source, and ensure the maximum amount of water reaches the fields for agricultural use, while maintaining the original layout and the traditional method for distribution. The Tifnout initiative has so far reinforced the irrigation systems of three villages (Tasloumt, El Moudaa and Talat N'amrane) with a total of 3,300 meters of PVC and 300 tons of cement through support from the Japanese Embassy, and has plans to replicate the PVC piping intervention in nine additional sites in the coming year. The PVC piping has already shown results in reducing the amount of water lost by enabling its efficient and equitable transport across long distances, even during times of scarcity during the summer season.